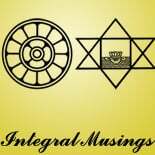 The path of integral management moves from within outwards. This approach requires a deeper understanding of the well known concept of modern psychology: Introvert and Extrovert. A somewhat similar terminology can be found in Indian yogic psychology but it has a much deeper connotation. In modern psychology “extrovert” is someone active, dynamic, oriental towards the objective external world of life and action, adventure and exploration. On the other hand “introvert” is someone indrawn and lives more or less predominantly in his subjective world of thought and feelings. The modern western culture in general puts a high value and respect on the extrovert and tends to look down upon the introvert as a negative type of personality. There is a similar terminology in Indian Yogic psychology: Antharmukha and Bahirmukha. But literally or superficially there is a similarity between the ancient Indian and the modern western concept. But the Indian yogic concept has a deeper meaning and the values are reversed. Antarmukha means literally someone whose face is turned inward and Bahirmukha is the one whose face is turned outwards. But to understand the deeper meaning of this yogic terminology we must have some understanding of Indian yogic psychology. According to the psychology of Indian yoga, human consciousness or personality, is made of three layers: surface, subliminal and the spiritual. The surface being is the one at the fringe of our consciousness tethered to our body; our surface personality is something narrow, limited, mechanical and repetitive, running around its petty thoughts, feelings, desires and sensation, or compulsively externalized with all its energies rushing outwards, incapable of any deep thinking or inward look. Behind this surface level, lies the subliminal self, less externalized or bound to the body, more inward, intuitive, with a much greater capacity for knowledge, feeling and action than the surface being. If we plunge deeper behind and beyond the subliminal and enter into the deepest and inmost core of our being, we will come into contact with the spiritual self within us, which is our true self. This spiritual self in us is in direct contact with the deepest, universal and eternal truth of all life and all that is. Just like externalization is spontaneous to the surface mind, the inward look is intrinsic, spontaneous and natural to the spiritual self in us. We are now in a better position to understand the yogic classification of Antarmukha and Bahirmukha in its relation to that of modern psychology. In the yogic terminology the Antarmukha is someone who lives in his inner subliminal or spiritual being, or in some form of a living communion with his inner being. He can see or feel or perceive the deeper, hidden and invisible forces behind the external phenomena which the ordinary man who lives in his surface self cannot see or perceive. So Antarmukha is not the superficial or morbid introvert, unhealthily preoccupied with his surface thoughts and feelings. The Antarmukha is a seer and thinker of inner realities, living from within outwards. All the spiritual personalities of the world and also the great geniuses in art, science, thought or literature are predominantly Antarmukha by temperament. They are in some form of a direct or living contact or communion with their spiritual or subliminal being and receive their intuition and inspiration from this inner source. We must note here that an Antarmukha need not necessarily be a monk or an ascetic spending most of his time in inner contemplation. He may live in his inner being or receive his inspiration from it, but outwardly he can also be a dynamic and energetic spiritual teacher like Vivekananda, the “Cyclonic monk” or a powerful personality like Gautama Budha, acting from a deep ocean of calm and self-mastery. The other type is Bahirmukha, externalized. In the yogic psychology, Bahirmukha is the one who lives more or less exclusively in his narrow, limited and externalized surface personality, with no contact with his deeper and inner being. He lives more or less exclusively in this externalized surface self and has no inner life. When he encounters a failure, difficulty, challenge, sorrow or pain, he may turn to religion, philosophy or yoga but he cannot achieve much beyond some superficial knowledge, belief, piety or devotion. If he takes up yoga and tries to meditate or observe himself he may end up as a morbid introvert closed within the schizophrenic subjectivity of his surface self. The Bahirmukha is predominantly an extrovert spending his outgoing energies feverishly on some small and petty desires of his physical and sensational being. However all extroverts are not entirely Bahirmukha. Most of t he great leaders of action like Napolean, Alexandar or JRD Tata are extroverts but they don’t live entirely in their surface being. Many of them are in some form of living contact with a subliminal source of vital energy, which is the basis of their dynamism and achievement. We use the word “vital” to denote that part of our being which is the source of our sensation, emotions, enthusiasm, vitality and the dynamic faculties of action. Behind our surface vital being there is a deeper subliminal vital being with a much greater capacity for feeling, action and energy. Most of the great men of action are in contact with this subliminal vital being. For example, it is said about Napolean that he had the habit of taking a short nap in a chair for a few minutes and wake up with great energy. It is perhaps not a nap but some form of meditation for going inward and coming into contact with his subliminal vital being. In general, eastern spiritual culture emphasized on introversion and gave the highest respect and importance to the Antarmukha. On the other hand the modern secular culture of the West emphasizes on extroversion and encouraged the values and attitude of the Bahirmukha. But in an integral perspective both are one-sided perceptions. A civilization or culture with a too heavy emphasis on an ascetic world-denying introversion will be lacking in the vital vigour of life, which makes it an easy prey to more vigorous and strong invaders. On the other hand a civilization or culture, which tends more or less exclusively or predominantly to extroversion will be lacking in mental, moral, aesthetic and spiritual creativity and will remain gross, crude and barbaric, in its outer life however advanced it may be in its technology, organization or military force. So an integral approach to human or social development will strive towards a creative balance between introversion and extroversion. However an integral spiritual culture may still emphasise on the inner self as the foundation for a balanced and healthy outer life because most of our higher potentialities in the mental, moral, aesthetic and spiritual domain lies in our inner being and not in the externalized surface self. But it will not discourage extroversion in an ascetic spirit. The outer life and action has to be a creative externalization of our inner and higher potentialities of our deeper, greater and nobler self. This entry was posted on March 25, 2014 by integralmusings in Harnessing the Human Potential.